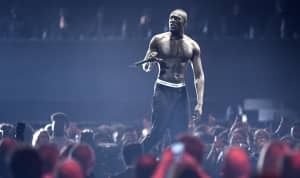 Stormzy is nominated for the 2017 Mercury Prize for his debut album Gang Signs & Prayer. At the ceremony tonight, September 14, in London, he recreated his iconic balaclava-clad album cover for a goosebumps-inducing performance of album tracks "First Things First" and "Blinded By Your Grace Part I." The stage later transformed into a church, lit up with stained glass windows. See the full performance above. Revisit Stormzy's FADER cover story here.